The expansion of white male suffrage in the 1830s led to an expansive strategy of political imagery that co-opted hatchets, axes, and log cabins as empathetic symbols that could be understood by anyone. 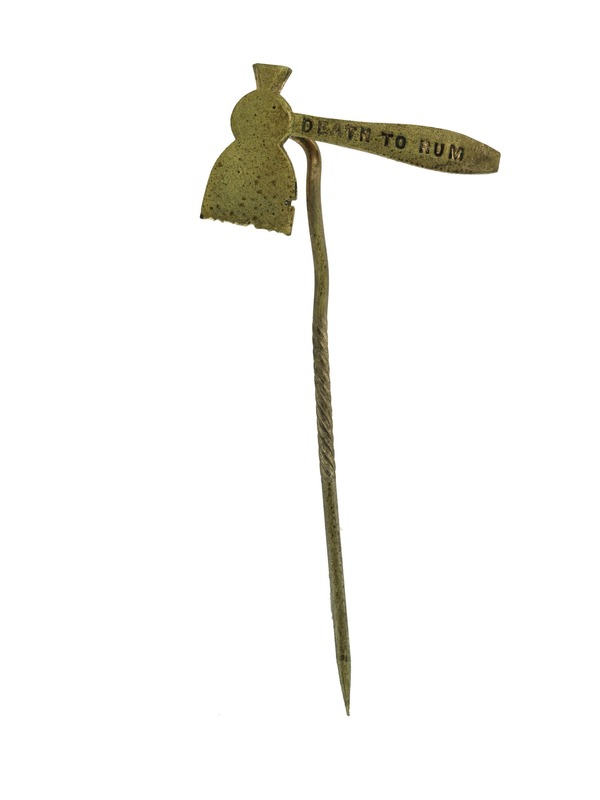 The exclusive use of such symbols masked the difficult and contentious positions of rival candidates and partisans who, with a wink and a nod, universally embraced the rough-hewn values of the American frontier. The Whig campaign of 1840 against incumbent President Martin Van Buren established a pattern of predetermined imagery, from which later campaigns have seldom deviated. 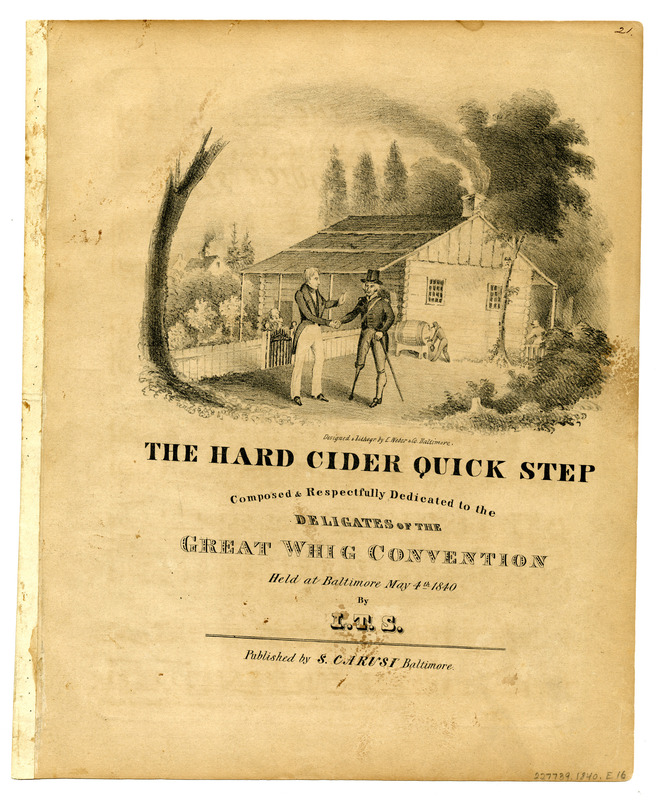 The Whigs adopted the symbols of the log cabin and hard cider to promote the candidacy of General William Henry Harrison. 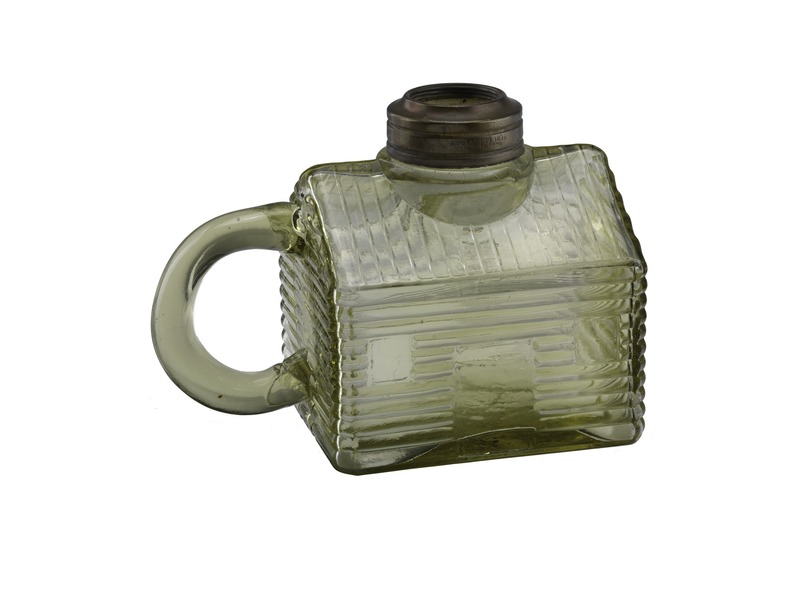 An outpouring of everyday ceramics with designs of log cabins and canes with miniature hard cider barrels for heads soon followed. 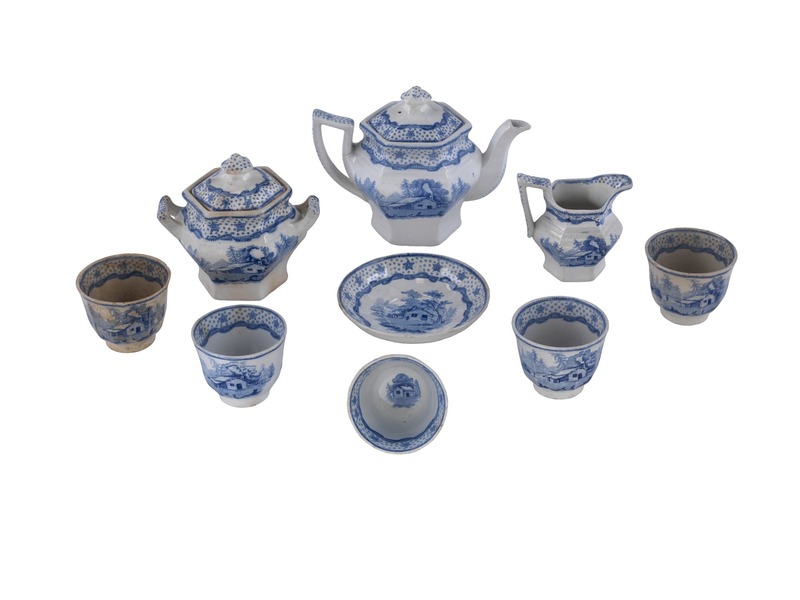 Whig glassware, spoons, covered dishes, and children’s tea sets all declared for log cabins. 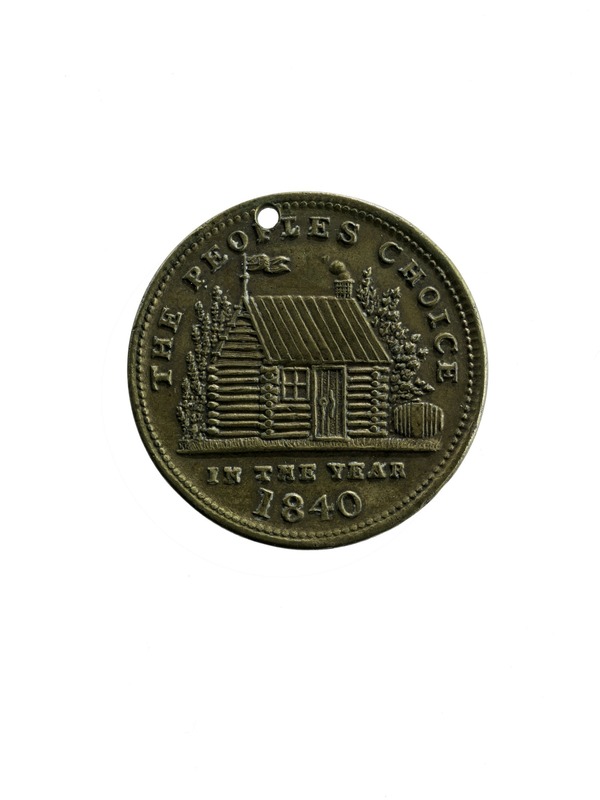 Medal, "The People's Choice in the Year 1840"
Sheet music, "The Hard Cider Quick Step"
A critical remark made by a Democratic newspaperman gave birth to the log cabin and the hard cider barrel as Whig symbols to promote the candidacy of William Henry Harrison. 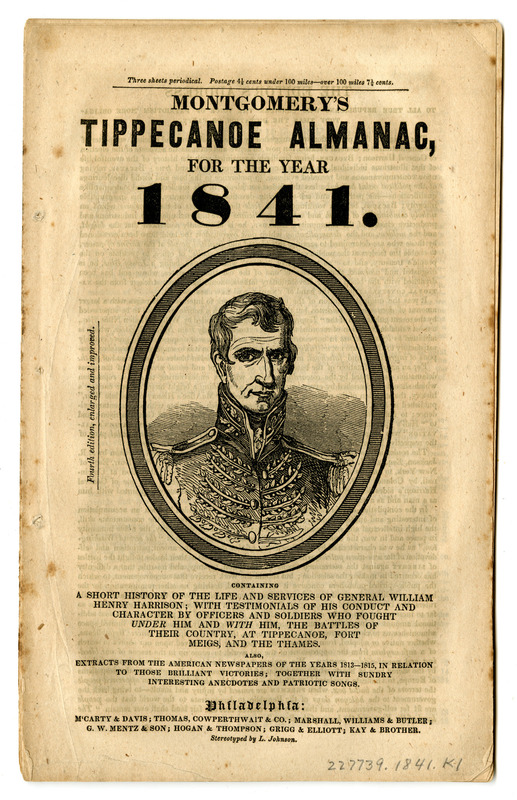 The newspaperman wrote that Harrison’s rivals could easily “get rid of” the old general with “a barrel of hard cider, and settle a pension of two thousand a year on him, and my word for it, he will sit the remainder of his days in his log cabin by the side of a ‘sea coal’ fire and study moral philosophy.” Though the Democratic press reprinted the suggestion as a cutting remark, Harrison’s Whig friends embraced the everyday attributes of log cabins and hard cider. The closely contested election of 1860 generated mass entertainments such as “Wide Awake” torchlight parades staged on behalf of Republican presidential candidate Abraham Lincoln. Banners, badges, and ribbons proclaimed allegiance to the Constitution and the Union. This fence-rail piece is one of many made for the friends of Abraham Lincoln. This piece from 1830 is attributed to Lincoln’s cousin and rail-splitting partner, John Hanks. 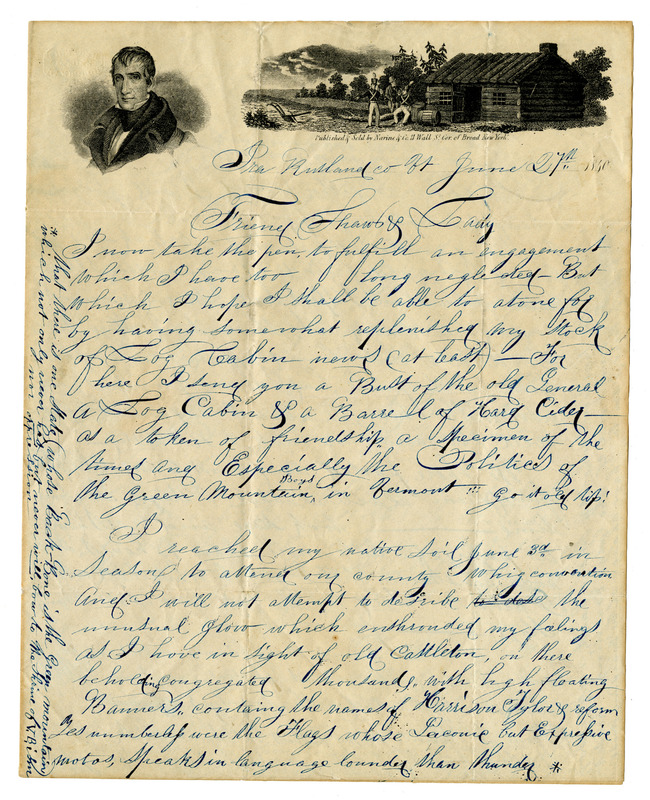 Dennis F. Hanks (another cousin) sold it at the Northwest Soldiers’ Home Fair in Chicago in May 1865, a little more than a month after Lincoln’s assassination. Dennis Hanks wrote the label for each fence rail for his illiterate cousin John Hanks, who added his X as an affidavit. John Hanks was one of two men who had carried fence rails into the Illinois State Republican Convention that made Lincoln its presidential candidate in 1860. The imagery reversed Lincoln’s public persona, from the attorney he had become to the rail-mauling day laborer he had been. By her own account, temperance reformer Carry A. Nation used rocks, a sledgehammer borrowed from a blacksmith, and a bar room billiard ball to destroy five Kansas saloons—before she took up a hatchet to destroy a Wichita, Kansas, saloon on December 27, 1900. Saloons were illegal under Kansas state law, but tolerated by officials. Explaining her choice of weapon, Nation recalled that the state’s “liquor interests” had nothing to fear from the usual temperance advocates, “but they were not prepared for a furious woman and a hatchet.” Her saloon smashings became known as “hatchetations”—a play on words coined by the publicity-savvy Nation. 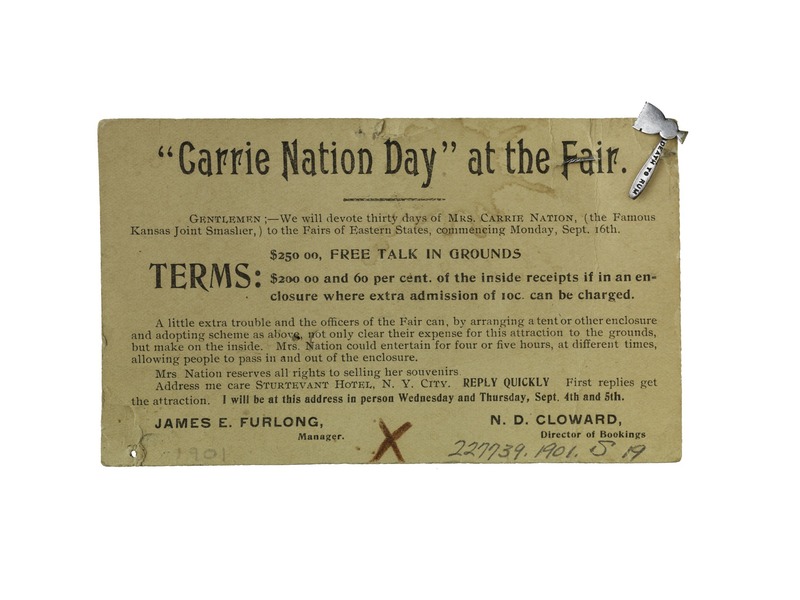 A Topeka, Kansas, druggist supplied Nation with little pewter hatchets to sell to cover her legal fines and travel expenses. 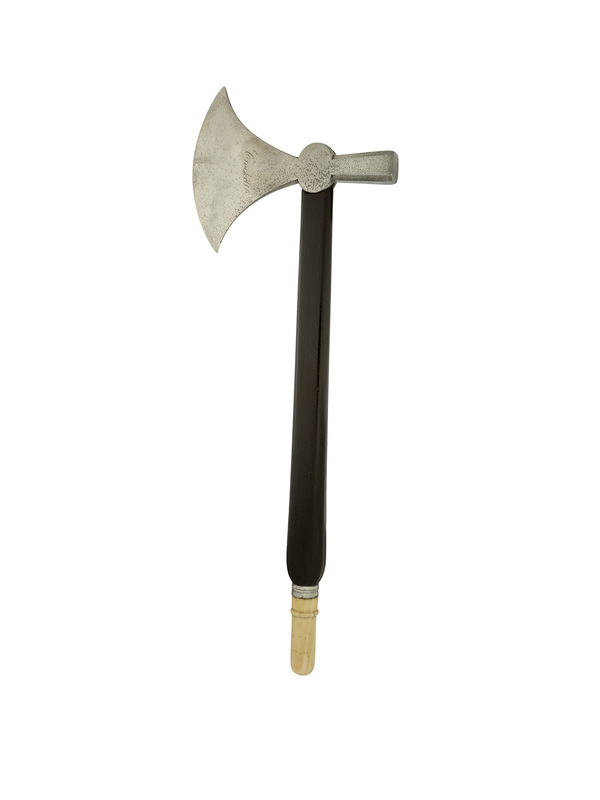 Nation found that the public clamored for her hatchet souvenirs and readily grasped the meaning of them. 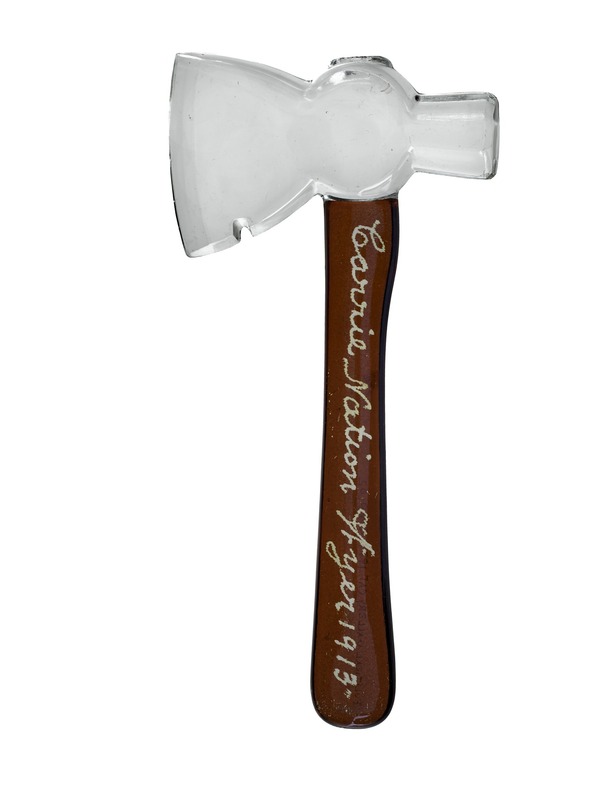 Though distancing themselves from Carry A. Nation’s “hatchetations,” the Woman’s Christian Temperance Union (WCTU) and other organizations could hardly ignore the hatchet as a symbol of teetotaling activism and popular engagement. 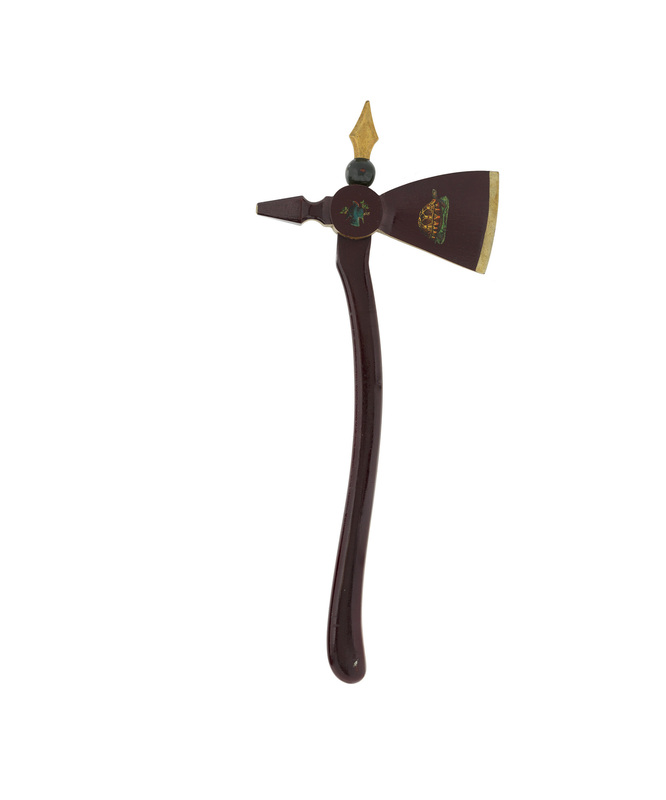 Somewhat at odds with this message, the hatchet’s head is decorated with the emblem of a box turtle, an icon of dryly unexcitable endurance.